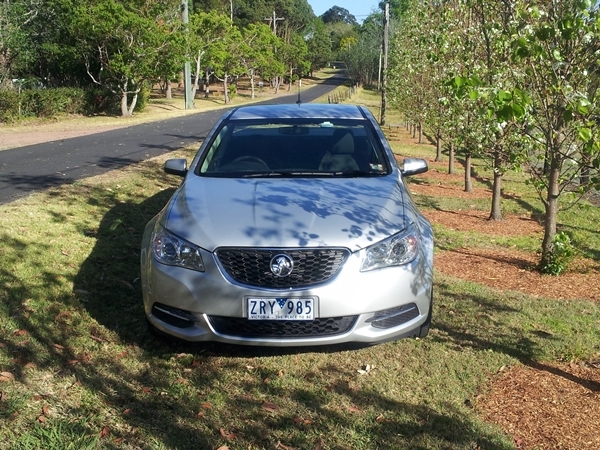 Holden has upped the features on its standard Ute range. The latest VF Holden Ute not only comes packed with features but looks great as well. 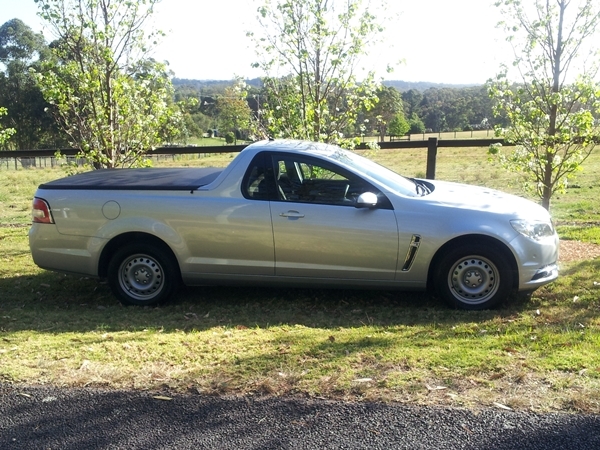 The VF Ute launched in May 2013 is by far the best Ute Holden has built as a standard offering. The extended cab style and sleek lines enhance the sporty appearance combined with the shark gill behind the front wheel. The overall length of 5062mm, height of 1494mm and width of 1848mm provides a squat appearance. The 16inch steel wheels with 225/60 tyres are bland but par for the course for entry level. From the front the designers have excelled as the grill and bonnet look spot on. The twin rear exhaust also sparks the appeal. Step inside and the immediate response is pleasantly surprised. The cloth seats are comfortable, have adequate slide adjustment for all but the very tallest of drivers and have electrically adjustable lumbar support and height adjustment for the driver. There is good visibility front and back, however the ‘A’ and ‘B’ pillar provides two blind spots. The side mirrors are a little small but adequate. In front of the driver is a height and reach adjustable steering wheel that while plastic is comfy in the hands and has good feel. The steering wheel houses the cruise control, Bluetooth and stereo controls. Behind the steering wheel the column stalks are visible ( a pet bugbear of mine when you can’t see them). The indicator stalk also houses the controls for the MFD. Speaking of the MFD it sits between the two larger dials on the dash and provides enhanced multi-function display monochrome) with vehicle information, trip information, fuel economy and warning/messages. Storage is a mixed bag. The door pockets are handy, two cup holders in the centre console, large glove box, sunglass holder, smaller centre console bin (which houses the audio inputs) and a handy area behind the seats with storage nets. The VF Ute is no longer a base poverty entry level ute (hasn’t been for a while now), coming packed with standard features that include: dual-zone climate control, Electric Power Steering (EPS)that is well weighted and provides excellent feedback, Auto Park Assist, Front and Rear Park Assist, automatic release electric park brake, hill Start Assist, Trailer Sway Control and remote vehicle start (automatic models only). Add to this electric windows, automatic headlights and a host of comfort and safety features and you are looking at a well balanced offering. Entertainment is well catered for with the Holden MyLink Infotainment System with 8” high-resolution colour touch-screen display. This includes embedded Apps including Pandora® and Stitcher SmartRadio™, single CD player with MP3 capability. Full iPod® integration including Siri Eyes Free* and touch screen access for playlists, artist, albums, songs and genres. Enhanced voice recognition: phone calls, radio, navigation, smartphone/iPod®/MP3 or USB audio control, Bluetooth® audio streaming and auxiliary input jack. The VF Ute is powered by the now very familiar 3.6L SIDI V6 engine with 6 speed automatic transmission with Tiptronic driving the rear wheels. The engine provides maximum power of 210 Kw @ 6,700 rpm and torque 350 Nm @ 2,800 rpm. It does nothing wrong, provides more than enough power and is relatively economical. We achieved around 11.5L/100K around town and about 7.5L/100K on the freeway. The VF Ute will tow about 1600Kg with no issues but the load capacity is less than the magic one tonne. Safety is a key feature with 5 star ANCAP safety rating. Standard features include 6 airbags (dual front driver and passenger, side impact thorax/pelvis and curtain airbags), Electronic Stability Control (ESC) incorporating: Anti-lock Braking System (ABS), Electronic Brakeforce Distribution (EBD), Electronic Brake Assist (EBA), Traction Control System (TCS), rear view camera (all cars should have one) and front and rear park assist. 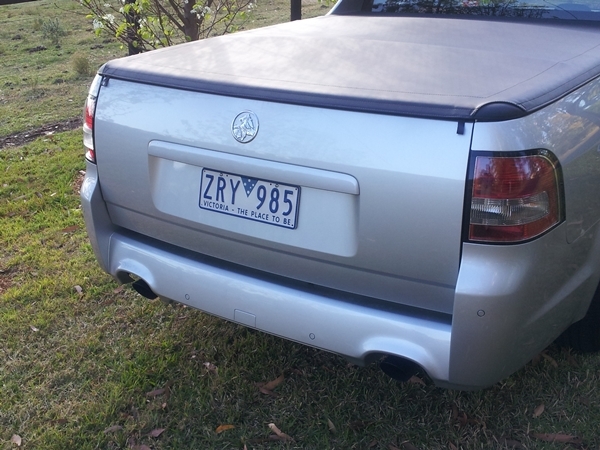 So here we have an entry level ute that isn’t so entry level. For around $37,500 for the VF Ute buyers have an abundance of standard features, comfort for long trips, relatively sporty performance, great looks and practicality for two people in abundance. It isn’t the B and S tyre burner , nor is it the tradie one tonner, but will provide years of faithful service with style.